Russafa offers a new concept from traditional hostels. we are just five minutes walking from the train station . The rooms have been designed for well-being and relaxation. They are full of light, neatly decorated and with the most comfortable beds in the city. 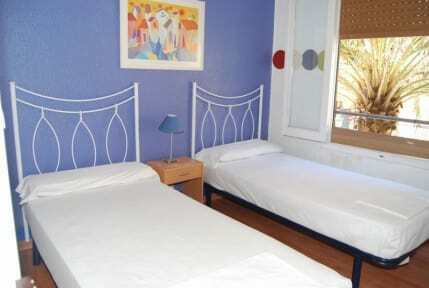 Our hostel is featured by its warming style, and we specially take care of cleanness. All the inside of the hostel is new, . Open 24h. Free breakfast. Common room .Wi Fi. Pic-Nic area Free Security Lockers. Fresh linen and towels are included. 1 complete bathroom every 3 rooms. Heating and fans. Cancellation policy.- cancellations until 48 hours before arrivals are not charged. Low of 48 hours bookings be charged the first night in bookings for 1-2 nights. bookings for 3 or more nights be charge 2 nights. Groups up to 8 people can not reserve directly online. For larger groups, please email us directly. We have not housing for children. People over 45 years old must book only private rooms. Russafa was great! I was just there for one night and had to leave early in the morning, and the staff helped me with directions to the train station and left breakfast out for me since I had to leave before breakfast officially started. Beds were comfortable and common rooms were nice. Loved my stay here. The free breakfast was great, the room was lovely, and the staff was INCREDIBLE! They were so warm and welcoming from the minute I got there to the time I left. Definitely recommend! Really great place! Great price, comfortable beds and super friendly staff. They really went out of the way to make sure you had everything you need! I had a very nice stay in one of the Hostel's private rooms, which was warm and cosy. The owner was incredibly charming, helpful and did everything to make me feel at home. Would very much recommend staying here! Joseph (sp) was so nice and made sure i had everything I needed! Very comfortable stay in a really cool area. Breakfast was awesome as well. Thanks! I enjoyed my stay at the Russafa. It can be a bit quiet, but I met some decent people and felt well taken care of by the hosts. The free breakfast was also a nice touch. It is in a decent area, with restaurants nearby and a 15 to 20 min walk from the main town centre. The staff were super helpful and accommodating. The location is perfect! Right in the heart of the city and nearby so many restaurants and sights. The rooms were comfortable enough and the complimentary breakfast was nice if you’re traveling on a budget. The bathrooms were well maintained, and even though the hostel seemed fully/mostly booked, it never got noisy or crowded. Would stay at again. Excellent price-quality ratio. Facilites are great and even good breakfast included. Only downsides I can think of are lack of social activities and noice from the street (stopped around midnight). Would recommend! 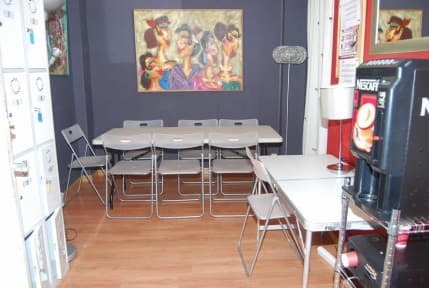 Very centrally located hostel, friendly staff and breakfast is included. I would stay there again!